With the build up to your wedding day taking up time and attention, it’s easy to forget things you need to look out for at the reception. Vintage Style Wedding Dresses are perfect for any wedding reception so we have you covered there. We also have some top tips on ways to really enjoy the whole of your wedding day. So once you’ve sashayed down the aisle in your fabulous short wedding dress it’s time to enjoy the rest of your day. These pointers will help make the most of your remaining time on your wedding day. It’s a great feeling to be surrounded by your family and friends on your big day. They have made an effort to be with you and watch you make a commitment to each other. Now it’s time to thank them. Is tradition to have a receiving line where you greet guests individually and thank them for coming. Another option is to set up drinks and work your way around the room thanking people. There will be lots of people who have helped along the way that you want to give a special thanks to (which can be done in the speeches). There is nothing better than an extra hug and thank you. Plus it gives lots of time to show off your vintage inspired wedding dress up close. You may be feeling relief at this point from the nerves and the drinks might be flowing. But go steady early on as you may not have eaten much and the bubbles will go straight to your head. So maybe alternate drinks or drink slowly as there is still so much of the day to enjoy (& remember). Take a few minutes out with your partner and talk about your day so far. Although you’ve just got married, with lots of people around it’s hard to get any quality time together. In between photographs or during a lull, sneak off to a corner and be together. It sounds obvious but when you all sit down to the meal, make sure you eat. The excitement and fun is great but you need the energy for the rest of the day. The good thing about a short wedding dress is that it will fit perfectly and won’t get in the way. There is nothing worse than being unable to relax in a stiff corset. Whilst your guests are all sat down it’s a good time to visit the tables and find out how people are enjoying themselves. Make sure you’ve eaten something first! After all, this is a celebration and a fantastic time to be with the ones you love the most. Take the little kit your bridesmaid or chosen one has got and reapply your make up. If you have a bolero or jacket with your short wedding dress, now is a great time to remove it. You’ll re-emerge fresh and ready for more photographs. This is when taking your veil off (if you have one) or changing your shoes will help you feel relaxed. Lots of our brides change into another pair of shoes after the ceremony so that they can dance the night away. 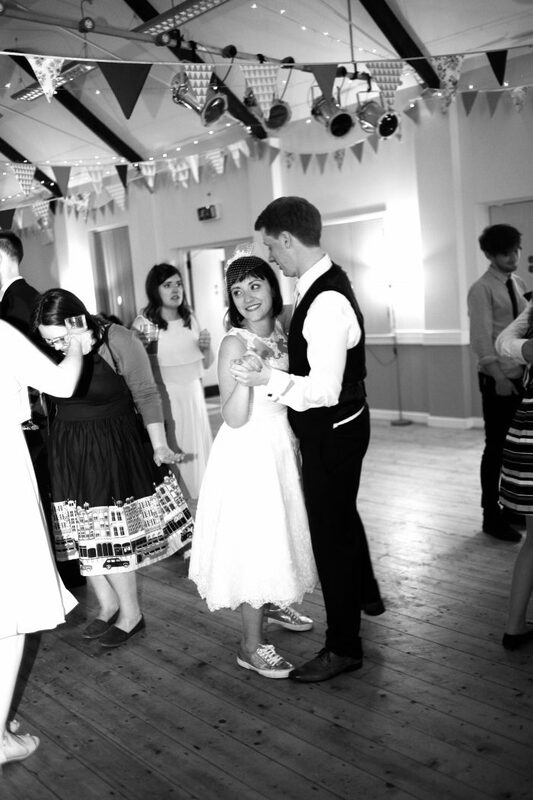 Our vintage style wedding dresses are great for spinning around the dance floor. Make the most of it with flat shoes or sparkly trainers. If you need help finding your perfect wedding dress, we have vintage style short wedding dresses galore at our boutique. Why not book an appointment today to try a selection in a relaxed one to one consultation. Our friendly team will talk to you about what you are looking for in a short wedding dress and help you make a decision based on your style.